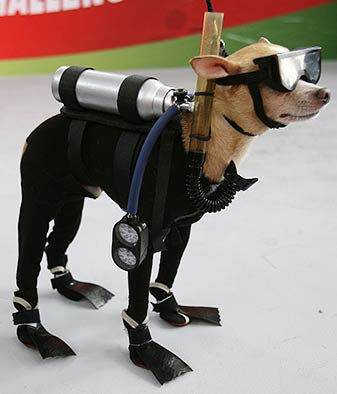 Mondex, a 5-year-old Chihuahua, poses as he walks the aisle dressed as a scuba diver during a dog show at a mall in Manila, Philippines, April 27. Mondex bagged first place during the fashion show category. He is cute. My friend had a chihuahua dog named Saige. I think they will be a good couple. Hmm... it looks like very prepared about it. Oh my, what a cutie pie! Ang cute nya sa attire na yan...hehehe. Wow ..I never seen any dog in thid dress.I like this Chihuahua dog.Thanks for manage a partner for this nice Chihuahua. Go ahead and just jump in the water. It is looking very much cute.Can it dive? Oh my goodness! What an adorable sight!! We have a chihuahua too. I'm going to have to show this one to my husband for sure! I just want to see the video that what it does after diving.